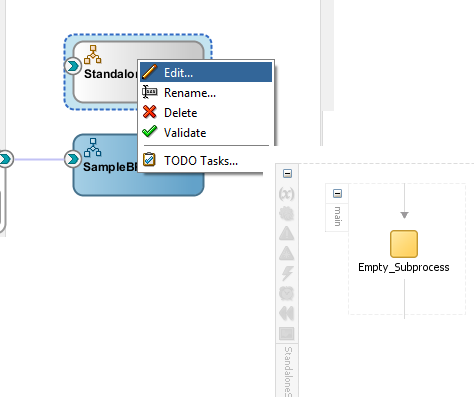 There are many features introduced in SOA 12c to increase developers productivity, one of the feature is sub process. We already discussed about what is sub process and types of sub process available in SOA 12c, click here to read the post if you missed to read earlier. We discussed in detail about Inline sub processes in previous post. Click here to read that post. That post explains how to create and use Inline sub processes. In this post we will discuss about standalone sub processes. We will see how to create standalone sub process and how to use existing standalone sub process inside composite. 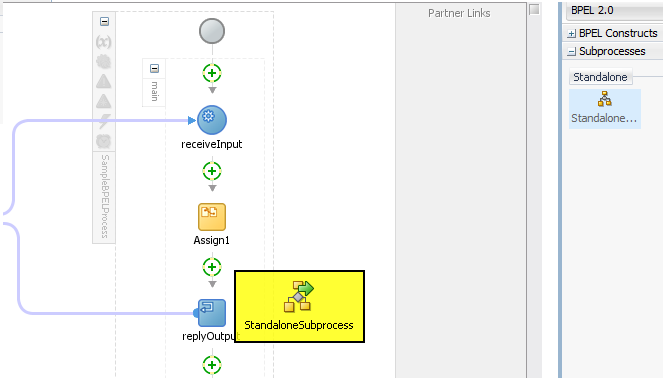 Opposed to inline sub processes, standalone sub processes are not confined to parent BPEL process, we can use these standalone sub process across different BPEL process but we can use these processes inside one composite only. These sub process are used when we need to re-use the whole component multiple times in one composite. If we have logic which needs to implemented in one composite multiple places then we write that logic inside standalone sub process and call that sub process from BPEL process using call activity. We have created one sample SOA composite and added one synchronous BPEL process to it. 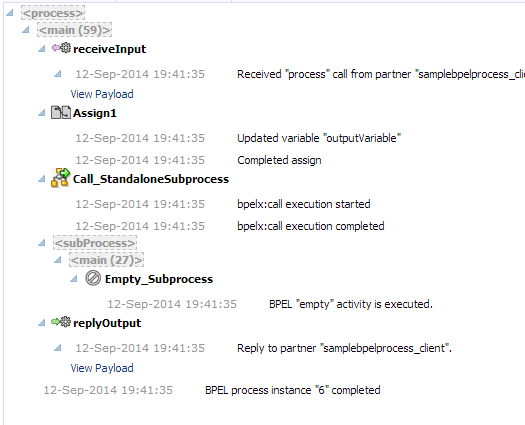 Inside BPEL process we simply assign request message to output. Now we will create a standalone sub process in this composite. 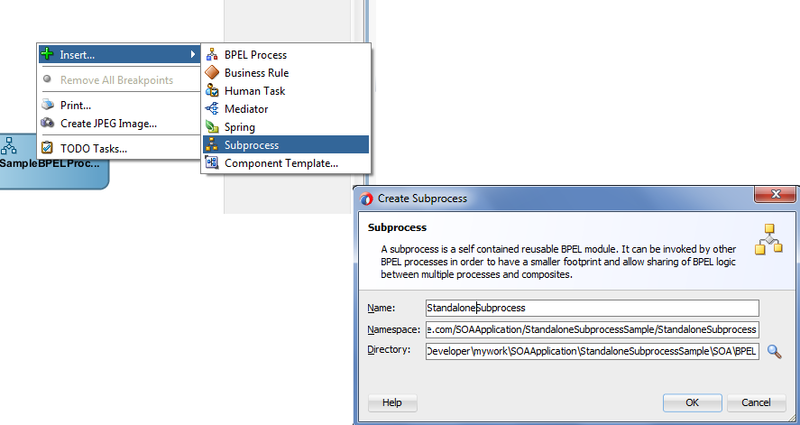 To create a standalone sub process, right-click on the composite and click on Insert and choose “Subprocess” option. This opens another pop-up window where we can the process details. You can edit the details as per your environment, once done click on ok. This will add one standalone sub process to the composite file. Once you create the standalone sub process, you can see that sub process inside component palette. If you notice this sub process further categorized as standalone sub process. Once we are done with standalone sub process creation, next step is to edit the standalone sub process. To edit the standalone sub process, right click on the sub process and click on edit. This opens sub process flow and you can add required logic inside that. Once we add the required logic in the standalone sub process, next step is to use above created standalone sub process inside BPEL process. To call the standalone sub process from BPEL process, drag the above created sub process from component palate and drop it to BPEL process. You can rename the call activity as per your naming standards. 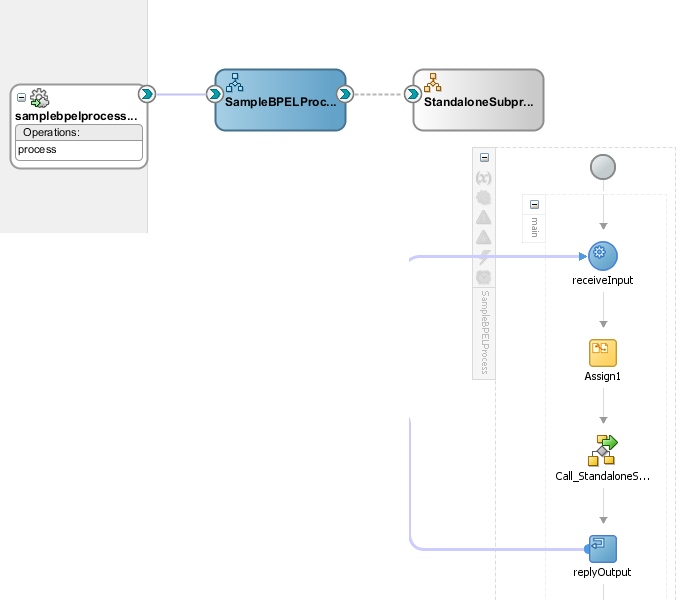 You can drag multiple sub processes in one BPEL process, you can also use this sub process in another BPEL which is there is same composite. Once you are done with above step, your BPEL process should look like below. You also see BPEL component get wired to standalone sub process through dotted wire. Once we are done with above steps, deploy your composite to server. All the sub process automatically get deployed to server when we deploy composite as these sub process are part of composite only. Test the composite and you can see that standalone sub process get triggered. Thanks for an informative post on 12C features. Pick activity is used in below scenario's. When we call asynchronous service and we need response back in certain time frame otherwise we need to throw exception. Check below post for more details. Check out below post for more details.